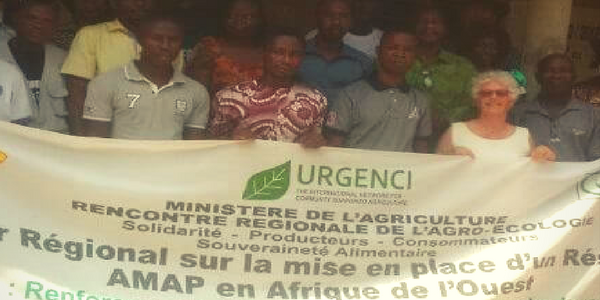 We are women and men, farmers, Community Supported Agriculture (CSA) activists, agronomists, agro-ecologists, agro-ecology trainers, Food Sovereignty activists, Civil Society actors from 7 different countries in West Africa. We come from Benin, Burkina Faso, Côte d’Ivoire, Ghana, Mali, Senegal and Togo. Over and above the current extraordinary social and economic challenges, our societies are all confronted by the realities of climate change and increased food insecurity, and are facing situations of extreme vulnerability. We are all confronted by the overwhelming attempt by industrial agriculture and agribusiness to dominate society. It is creating the impoverishment of peasant farmers, land grabbing and capture of peasant seeds. Consumers do not have access to sufficient information or financial means to buy healthy local food. At the very moment when, confronted to these shared issues, what we need is greater exchanges, resource sharing and mutual support, yet borders are closing, and there is a risk that West Africa may become a space of division, where neither producers or consumers will be the winners. We, as committed grassroots civil society actors, and members of civil society, share the vision of West Africa as a space that can bring us all together. In our communities, we are working on a daily basis to craft new solutions. Caring for and nourishing the Earth and the humans it feeds lies at the heart of our concerns. We demonstrate on a daily basis that agro-ecology, implemented by family farmers and supported by committed consumers, provides more effective answers to the environmental challenges than those promoted by industrial agriculture. We need to share the collective promotion of our collective agro-ecological solutions. Agro-ecological initiatives through local solidarity-based partnerships between producers and consumers need to increase in Africa!